John Martyn's follow-up to 1973's Inside Out is a much more song-oriented, less experimental effort which concentrates on the joys of home and family. Sunday's Child skillfully blends the sensual ("You Can Discover") with the sweet ("My Baby Girl"), the modern ("Root Love") with the traditional ("Spencer the Rover"), and the tormented ("Sunday's Child") with the satisfied ("Satisfied Mind," "Call Me Crazy") while retaining its cohesiveness. The record, his sixth on his own, shows the many facets of Martyn's playing, from his effects-driven electric guitar to his signature acoustic work, which can be both aggressive ("The Message") and gentle ("Lay It All Down"). This album contains a collection of strong original songs, as well as a pair of wonderful covers: the traditional British ballad "Spencer the Rover" and the country standard "Satisfied Mind." 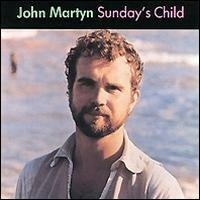 His last recording of new material for three years, Sunday's Child is a fine farewell to this period of John Martyn's ever-changing career. Released in January 1975 and recorded and mixed during August 1974 at Island Studios. The sessions were short but intensive, producing songs of considerable contrasts from the boogie of Clutches, to the traditional folk song of Spencer The Rover. The overall feel of the album is one of contentment and John called it 'the family album, very happy purely romantic...a nice period', an impression borne out by My Baby Girl, which featured Beverley on vocals for the last time. The Message is a very underrated song and worthy of more attention than it gets. Many of the songs such as One Day Without You, Lay It All Down and You Can Discover are pure emotion and romanticism. My Baby Girl and Spencer The Rover are dedicated to two of John's children.